The "Gospel of Jesus's Wife," a papyrus written in Coptic and containing text that refers to Jesus being married, is looking more and more like it is not authentic, research is revealing. A growing number of scholars have denounced the business card-sized papyrus as a fake, with recent op-eds appearing in The Wall Street Journal and on CNN. Meanwhile, Harvard University, which announced the papyrus' discovery, has fallen silent on the artifact, not responding to requests for comment on new developments suggesting the find is a forgery. The fragment contains the translated line, "Jesus said to them, 'My wife …'" and also refers to a "Mary," possibly Mary Magdalene. If authentic, the papyrus suggests some people in ancient times believed that Jesus and Mary Magdalene were married. At the time of the discovery, King tentatively dated the papyrus to the fourth century A.D., saying it may be a copy of a gospel written in the second century in Greek. Recent radiocarbon dating suggests that the papyrus may date to between the sixth and ninth centuries A.D. Documents provided by the anonymous owner published in an essay by King recently in Harvard Theological Review say that the Gospel of Jesus's Wife was purchased from Hans-Ulrich Laukamp in 1999 and he, in turn, obtained it in Potsdam, in what was East Germany, in 1963. A Live Science investigation published last week revealed that Laukamp was co-owner of ACMB-American Corporation for Milling and Boreworks in Venice, Florida. The man listed as representative of Laukamp's estate in Sarasota County, Florida, Rene Ernest, said that Laukamp didn't own this papyrus, didn't collect antiquities, didn't have an interest in old things and was living in West Berlin in 1963 — as such, Laukamp couldn't have reached Potsdam across the Berlin Wall to purchase this papyrus. Laukamp died in 2002. Axel Herzsprung, who was another co-owner of ACMB-American Corporation for Milling and Boreworks, also said Laukamp didn't own this papyrus and didn't collect antiquities. Additionally, since the investigation was published, Live Science has been in contact with an agency in Berlin that issues permits for the exportation of antiquities. Representatives of that agency said they could find no record that a papyrus like this had been exported from their office. It's possible that the Gospel of Jesus's Wife papyrus was exported from elsewhere in Germany or from the European Union. Just recently, Christian Askeland, a research associate with the Institut für Septuaginta-und biblische Textforschung in Wuppertal Germany, revealed new information that casts further doubt on the papyrus' authenticity. His work is set to be published in the journal Tyndale Bulletin and is currently posted on a blog. This second papyrus, which was carbon dated to between the seventh and ninth centuries A.D., is very similar to a Gospel of John papyrus, written and published by Egyptologist Sir Herbert Thompson in 1924, Askeland noted. In fact, the line breaks (the places where the text begins) are identical to those from Thompson's text. This is illustrated in an image of one side of the papyrus alongside Thompson’s 1924 text posted by Mark Goodacre of Duke University on his blog and republished on Live Science. "Seventeen of 17 line breaks are the same. This defies coincidence," writes Askeland. The John fragment is written in a dialect of Coptic called Lycopolitan, which had died out by the seventh century A.D., which would seem to confirm the fragment's inauthenticity, Askeland said. Tests carried out by James Yardley and Alexis Hagadorn of Columbia University found that the ink from the Gospel of Jesus's Wife and the John fragment are similar but not quite the same. The handwriting style, however, from the John fragment is similar to that of the Gospel of Jesus's Wife, Askeland noted. Given the similar handwriting and ink, and the identical owner, Askeland, and a large number of other scholars who have written online about Askeland's finds, argue that the Gospel of Jesus's Wife is likely also fake. Live Science contacted two Egyptologists who have examined the Gospel of Jesus's Wife firsthand to get their opinions. Malcolm Choat, of Macquarie University, who published an analysis of the writing of the Gospel of Jesus's Wife recently in Harvard Theological Review, says that he needs time to investigate Askeland's findings before he can comment. Similarly, Roger Bagnall, the director of the Institute for the Study of the Ancient World at New York University (the Gospel of Jesus's Wife was examined there at one point) said that he needs time to analyze Askeland's findings and those of other scholars before he can comment. If Laukamp did own both the Gospel of Jesus's Wife and the John papyrus, as the documents from the anonymous owner indicate, then this makes him an even more interesting and daring man. He would have had to cross the Berlin Wall in 1963, at the height of the Cold War, to obtain the Jesus' wife papyrus from Potsdam (and if caught, he would have to explain to East German police that the Jesus' wife papyrus was just an ancient manuscript and not a coded message). He also would, at some point, have obtained a fake Coptic papyrus of the Gospel of John that had very similar handwriting and ink to the Jesus' wife papyrus. He then would have hidden his collecting habits from Ernest (his estate representative in Sarasota County, Florida) and Axel Herzsprung, his closest business partner. The two Egyptologists who can verify any part of this story, Gerhard Fecht and Peter Munro, died in 2006 and 2009, respectively. Additionally, Laukamp didn't have any children and doesn't appear to have any relatives still alive. And if the papyrus was exported from Berlin at some point, antiquities officials there have no record of it. Can you win the lottery twice? 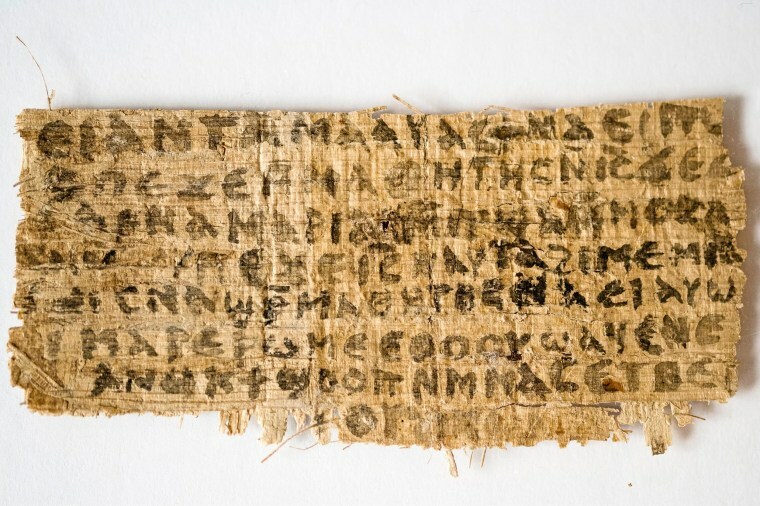 "If the Gospel of Jesus's Wife fragment is genuine, this already involves a pile-on of unusual and suspicious features that amounts to us having won the lottery," writes James Davila, a professor at the University of St. Andrews, on his blog. "Now another manuscript from the same cache written in the same hand again presents us with another pile-on of similarly suspicious features. At what point do we stop claiming another lottery win and just accept that the whole thing is a forgery?" Leo Depuydt, of Brown University, sent an email to several journalists and scholars saying that King should retract her findings. "When is this papyrological pantomime, this Keystone Coptic, this academic farce, this philological burlesque finally going to stop?" asked Depuydt in the email. King has remained silent on the new evidence. Calls made by Live Science to Harvard Divinity School's media relations office were not returned. Calls made directly to King's phone were also not returned. The reasons for the silence are unclear; there are unconfirmed reports that divisions have emerged within the Harvard Divinity faculty over the authenticity of the papyrus. A spokesperson for the Smithsonian Channel said that they are still planning to premiere their documentary on the Gospel of Jesus's Wife on Monday evening. Follow Live Science Twitter, Facebook & Google+. Original article on Live Science.